Our services in port handling include all local movements of import and export cargo within the port premises. We help you receive, shift, stuff, de-stuff, load, unload, store & dispatch all your shipments with complete safety and care. Our associate experts with vast experience in handling International Ports, Terminals, Jettys etc. develop Port operation manuals and emergency plans such as Disaster Management Plan for our Clients, mainly for the green field project developers. KEI-RSOS has more than 10 years experience in Port management & operations, we have own a fleet of 6 specialised Harbour Tugs of highly manoeuvrability with Voith , Schottle, Aqua, Rexpeller, duckpeller Propulsion and with adequate Bollard pull required to manoeuvre even Cape size Ships & VLCC tankers and also owns high speed Pilot launches and mooring launches. We offer consultancy and monitoring services of Port Operations to enhance the performance. We deploy our trained personnel to collect data, to analysis the following parameters and to submit our detailed report with suggestion for improvement / correction. We have a bank of senior Pilots, who have vast Domestic and International Pilotage experience. Our Pilots have rich experience in handling vessels of various sizes & types in all conditions of tides and current on the East and West Coast of India and abroad. SVS Group incorporated Silver Port Services in 2007 to provide port management services to minor and captive ports along the Indian coast line. 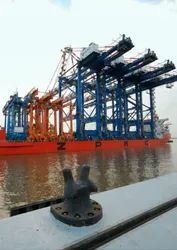 At Procam, we analyze decisive processes surrounding the movement of high value cargoes through vital locations across ports, terminals and berths for our bluechip clients. Capital Dredging, Maintenance Dredging, Underwater Drilling Blasting for Hard Rock, Shore Protection, Land Reclamation Beach Nourishment. Dharti Dredging And Infrastructure Ltd.
We have more than optimum setup of experts to manage the traffic load both Export and Import and their delivery to the Consignee. Job assistance are fully kept abreast of the Port / Customs Rules and Regulation for easy handling. Feasibility studies and concept plan for routing of pipelines & handling MSEZ multiple bulk liquid products at New Mangalore Port. Port management : KEI-RSOS has more than 10 years experience in port management & operations, we have own a fleet of 6 specialised harbour tugs of highly manoeuvrability with voith , schottle, aqua, rexpeller, duckpeller propulsion and with adequate bollard pull required to manoeuvre even cape size ships & VLCC tankers and also owns high speed Pilot launches and mooring launches.